Ever since Ernő Rubik invented the Rubik's Cube in 1974, the mathematical puzzle has tested the brains and patience of people of all ages. Two researchers working on molecular manipulation at the Laboratory of Atomic Materials (LAM) set themselves the challenge of making a version at the nanometric scale. "One evening, we were trying to think of a simple structure to reproduce, and the idea of the Rubik's Cube just came to us," say Almirka Dan Norcev and Yegor Naljapäev, two Ph.D. students at the LAM. Both are master cube-solvers and have taken part in European speedcubing competitions in the past. 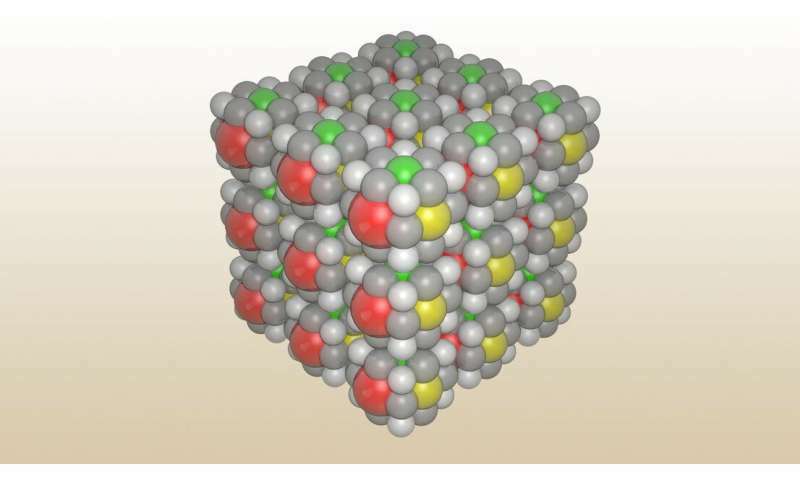 To create the tiny replica, the LAM researchers first isolated atoms of six elements – including boron (B), aluminum (Al) and gallium (Ga) – to act as the "colors". Then they linked the atoms to 27 C12N8Mg molecules. Using a scanning tunneling microscope, they were able to organize the molecules into a cube about three nanometers wide. Unfortunately, the LAM's Rubik's Cube can't be played. "The cubes are independent for now. We didn't create axes that would make it possible to rotate the different elements," says Norcev. But in light of their initial success, the two Ph.D. students are now working on a more complex version that uses oxygen and sulfur atoms as connectors. Norcev and Naljapäev hope to demonstrate the new molecular structure during EPFL's open house weekend on 14–15 September 2019.